After eleven beta versions and three release candidates, Godot 3.1 saw the light of day. The work lasted 14 months, which is 4 months shorter than the work on the revolutionary version 3.0. If you tried to use version 3.0 to create a mobile game, you probably quickly came across errors / restrictions in OpenGL ES 3.0 drivers. For example on my Redmi Note 4 there were no particle effects (Particles and Particles2D) which effectively discouraged me from using version 3.0. The new version of Godot solves this problem by adding a new GLES2 renderer with particles calculated by the CPU (CPUParticles and CPUParticles2D). However, you should remember to create the entire game using GLES2 because some GLES3 features are not available in GLES2. The second feature that I will definitely use are the static types in GDScript. Godot’s strength is easy prototyping. Flexible scene tree with simple GDScript language allows you to quickly check different ideas and mechanics. In addition, dynamic typing significantly speeds up such experiments. However, with larger projects this may lead to errors, decreased productivity/comfort of the programmer (no code completion when writing the code) and hinders refactoring. To solve this problem, the possibility to set the type of variables and functions has been introduced. So you can still create prototypes easily and pleasantly, then improve the target version. In the future, this information will also be used to optimize scripts during compilation. Safe lines in Godot 3.1 (19 line is not safe). 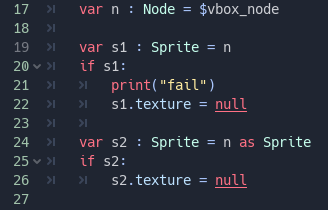 In this case, the line number will be green and the s2.texture = null line will be omitted. The editor itself has been significantly improved including inspector, 2D and 3D editor, animation editor and the file system dock. The visual shader editor has returned. Introduced deformations in 2D animations, opensimplex noise algorithm, CSG for rapid 3D prototyping and many more. The whole gives the impression of a much more stable and more mature product. You can support creators by becoming a patron. Previous Post: Agile Commander – Spring Sale!